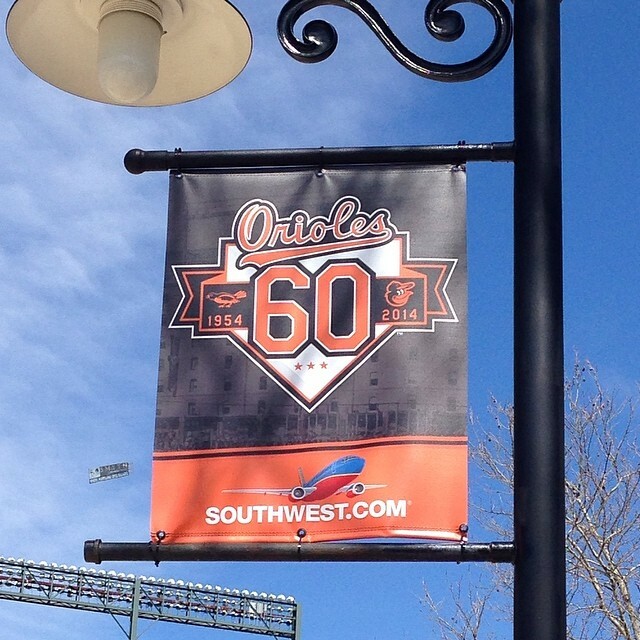 I have been going to Orioles Opening Day every year since 1989 (except when I lived in Memphis) and probably even a few before then. It seems it is always a nice day (I wasn’t here for the snow in 2003), and it seems we always win. Yesterday was no exception. 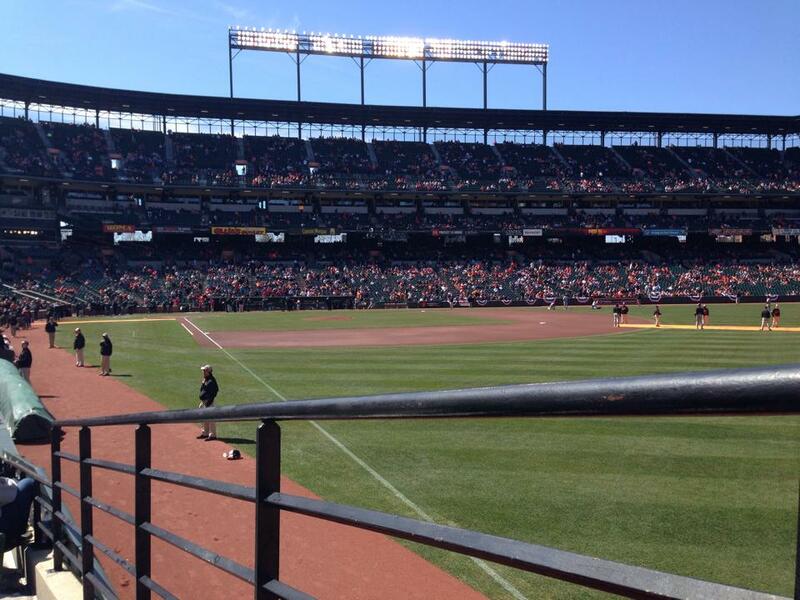 The Orioles defeated the defending World Champions Boston Red Sox 2-1 on a warm, but windy, sunny day. 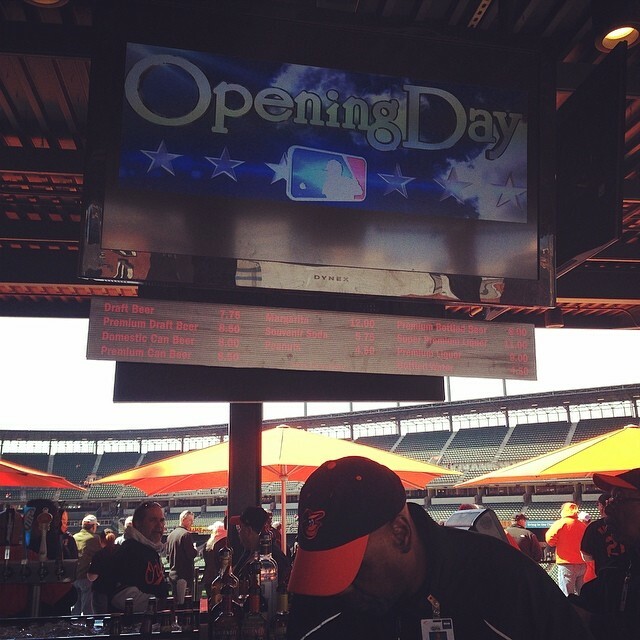 We started out our Opening Day at the Centerfield Rooftop Bar at Camden Yards. We got there early enough to secure seats at the bar to enjoy our pregame beverages. I recommend the Redd’s Apple Ale (not the Flying Dog on tap). They did not have Guinness or stout, so I had to make do. Wearing my new Orange Brady Anderson jersey, I hurried to my seat before 2:30 for the opening ceremonies. Much to my disappointment (MUCH! ), Brady was not announced. The past two years Brady Anderson was announced and took the field with the other coaches and trainers, but not this year. For the past few years, Brady has had an unspecified role with the Orioles helping with batting and training. Two years ago, Brady was named special assistant to the executive vice president Dan Duquette,and last year Brady was promoted to vice president of baseball operations. I am not sure why Brady wasn’t announced this year unless he is still in Florida. It took me a couple of innings to get over not seeing Brady, but after a huge (and I mean HUGE) turkey bbq sandwich from Boog’s I was feeling better. We had great seats, literally on the right field line. We had a great view and our own little row in section 6 (only five seats). New Oriole Nelson Cruz hit the go-ahead winning home run to put the Orioles over the Red Sox 2-1. The Baltimore Orioles are in first place, at least for today. What a perfect day for baseball! And, the Orioles beating the Red Sox made it that much sweeter. I had to settle for watching the game on MASN … but the Orioles on TV is, at least, better than no Orioles baseball at all!